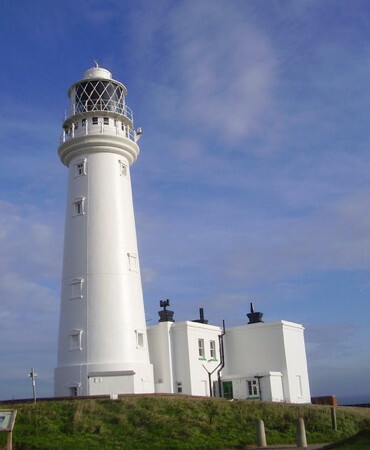 This page covers lighthouses of the eastern coast of England from Flamborough Head to the Stour, including the counties of East Riding of Yorkshire, Lincolnshire, Norfolk, and Suffolk. Facing the North Sea, this coastline includes the the busy ports of the Humber estuary and the sandy coast of East Anglia. The British system of lighthouse administration is decentralized, with the major towers under the management of Trinity House (a corporation chartered by the Crown) and smaller towers generally under the control of local port authorities. This system has generally assisted lighthouse preservation, and so has the British custom of building very sturdy brick or stone lighthouses at most of the stations. Most of the onshore lighthouses are accessible to visitors, and several of them are major tourist attractions. Chartered by Henry VIII in 1514, Trinity House has built and operated lighthouses in Britain for nearly 500 years. About a dozen of the lighthouses have Visitor Centres. Founded by serving and retired keepers, this lighthouse association is open to everyone. 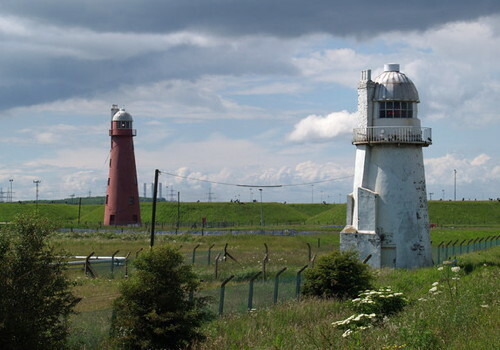 There is lots of useful information on this site by Michael Millichamp, including his Guide to English and Welsh Lights, an inventory of surviving English and Welsh lighthouses. Photos and articles on lighthouses of the British Isles. 1669 (Sir John Clayton). Never activated as a lighthouse. 24 m (79 ft) octagonal cylindrical white chalk tower. Nicholas Mutton's photo is at right, Alan Flynn has a closeup, Wikimedia has several photos, and Google has a street view and a satellite view. This remarkably well preserved seventeenth century tower is unique in England. It was designed as a lighthouse, but there is no evidence it was ever lit; it served for more than a century as a daybeacon. The tower was restored in 1996. 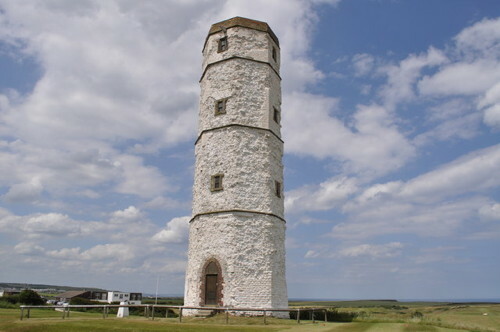 Located on Lighthouse Road at the fifth tee of the Flamborough Head Golf Club, about 800 m (1/2 mi) west of the 1806 lighthouse. Site open, tower closed. Owner/site manager: East Riding of Yorkshire Council. ARLHS ENG-274. 1806 (Samuel Wyatt). Active; focal plane 65 m (213 ft); four white flashes every 15 s. 27 m (89 ft) round brick tower with lantern and double gallery, attached to a 2-story keeper's house. 1st order Fresnel lens. Entire lighthouse painted white. Steven Ruffles's photo is at the top of this page, Photographers Resource has a page for the lighthouse, Trabas has a photo, Wikimedia has many photos, Huelse has a historic postcard view, Marinas.com has aerial photos, and Google has a street view and a satellite view. 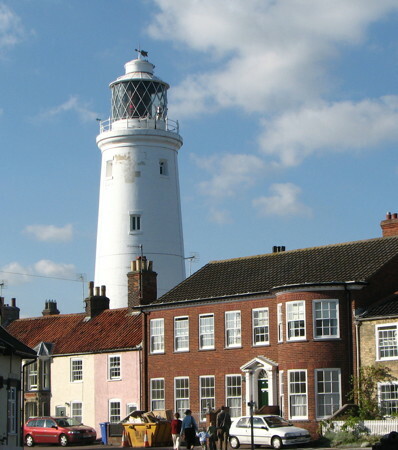 This stately lighthouse, one of England's best known, is a very popular tourist attraction, and Trinity House has licensed the East Riding Council to open the lighthouse to the public. The 200th anniversary of the lighthouse was celebrated in November 2006. The lighthouse was repainted in 2010. Located on a rocky point jutting into the North Sea about 10 km (6 mi) northeast of Bridlington. Parking provided. Site open; tower open to guided tours on a variable schedule, generally on weekends late March through easrly November and daily except Fridays in late July and August. Operator: Trinity House. Site manager: East Riding of Yorkshire Council. ARLHS ENG-042; Admiralty A2582; NGA 1964. Date unknown (station established 1852). Active; focal plane 12 m (39 ft); white flash every 2 s. 9 m (30 ft) fluted column with a lampost-style lantern, mounted on a square stone pedestal. Column painted white, lantern black. Red and green harbor control lights and a yellow fog signal (blast every 60 s) are mounted on the side of the column. Trabas has a closeup photo, Martin Pearman has a closeup street view, and Google has a satellite view. 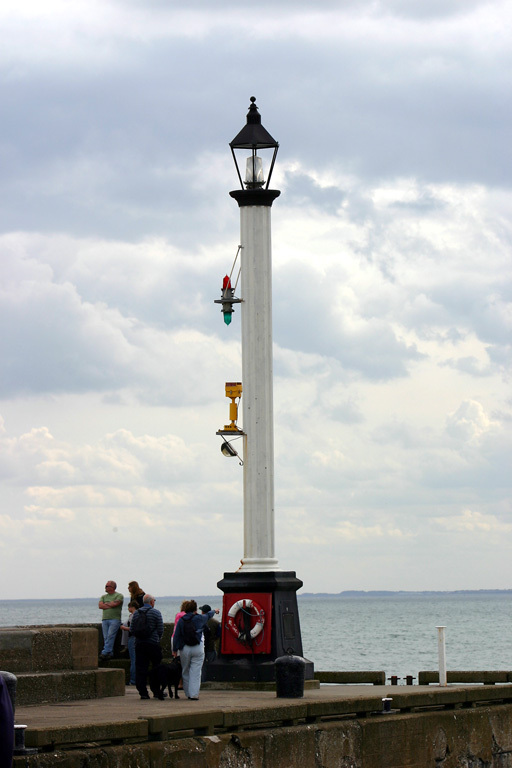 This elegant old post light stands at the end of the north pier at Bridlington. Accessible by walking the pier. Site open, tower closed. Admiralty A2580; NGA 1960. 1894. Inactive since 1972. 39 m (127 ft) octagonal brick tower with lantern and gallery, painted white. Graham Flint's photo is at right, Paul Davies has a fine closeup, Paul Harrop has a 2010 photo, Wikimedia has several photos, Huelse has a historic postcard view, and Google has a street view and a satellite view. The Fresnel lens from this light was transferred to the St. Mary's Light in North Tyneside (see Northeastern England). One of the best known tourist attractions of the Hull area, this restored light station houses a café and a museum of local and maritime history. The museum was started in 1989 by the Campbell family to house momentos of Kay Kendall, a family member who was a popular film star of the 1950s. Located on Hull Road at Arthur Street in downtown Withernsea. Site open, museum and tower open on weekends and bank holidays March through October, daily from mid June through mid September. Owner: private. Site manager: Withernsea Lighthouse Museum . ARLHS ENG-169. Date unknown (lightship station established 1820). Active; focal plane 10 m (33 ft); three quick white flashes every 10 s; also a continuous white riding light. 12 m (39 ft) square skeletal tower centered on a catamaran hull. The tower is enclosed by daymark panels. Ship painted black with a yellow horizontal band. 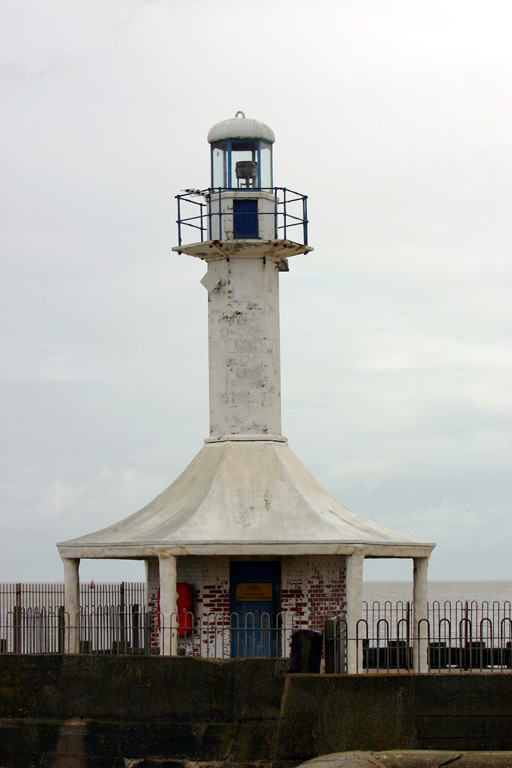 This lightfloat occupies the historic Spurn lightship station, about 10 km (6 mi) east of Spurn Point. Accessible only by boat. Site open, vessel closed. ex-Admiralty A2422; NGA 1772. 1767 (John Smeaton). Inactive since 1895. Foundations remain of this 34 m (112 ft) tower; it was replaced because a light was needed closer to the end of the spit. Site open. Owner: Yorkshire Wildlife Trust. Site manager: Spurn Point National Nature Reserve. ARLHS ENG-137. 1852. Inactive since 1895. 27 m (90 ft) round brick tower; the lantern has been replaced by a water tank. The tower was originally painted white, but only traces of the paint remain. The water tank is black. Peri Stracchino has a closeup, Wikimedia has Paul Glazzard's photo of both Spurn lighthouses, Marinas.com has aerial photos, and Google has a satellite view. This light was the front light of a downbound (eastbound) range. Spurn Point is a long barrier spit on the north side of the mouth of the Humber. Located just offshore on the estuary side of the Spurn Point spit. Site open, tower closed. Owner: Yorkshire Wildlife Trust. Site manager: Spurn Point National Nature Reserve. ARLHS ENG-139. 1895 (Sir Thomas Matthews). Inactive since 1985. 39 m (128 ft) round brick tower with lantern and gallery, painted with black and white horizontal bands. Neil Theasby's 2016 photo is at right, Photographers Resource has a page with good photos, a 2008 photo is available, Wikimedia has numerous photos (mostly from Geograph.com), Huelse has a historic postcard view, Marinas.com has aerial photos, and Google has a satellite view and a street view from the lantern room. Spurn Point is a spit curving out into the northern side of the entrance to the Humber. Long the site of military fortifications, it was transferred to a wildlife trust in 1950 and is now a popular and important nature reserve. 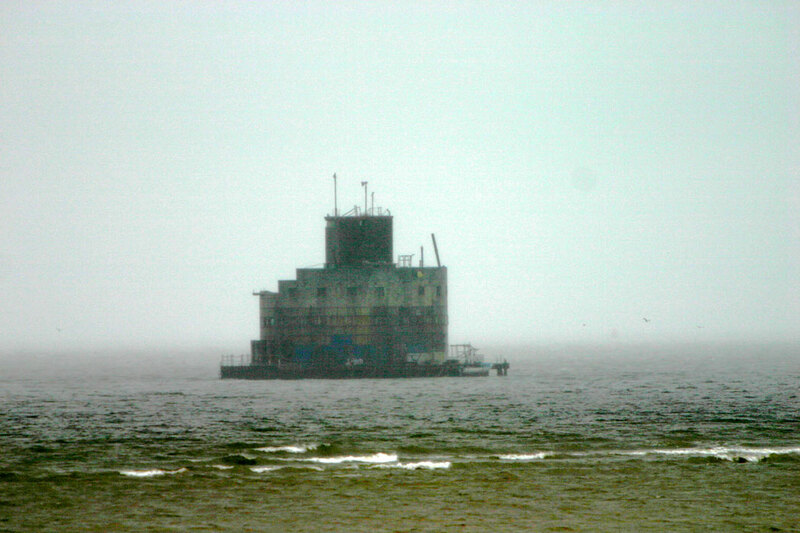 This abandoned lighthouse was endangered by lack of maintenance; Chris Cook's 2007 photo shows a deteriorating lighthouse. 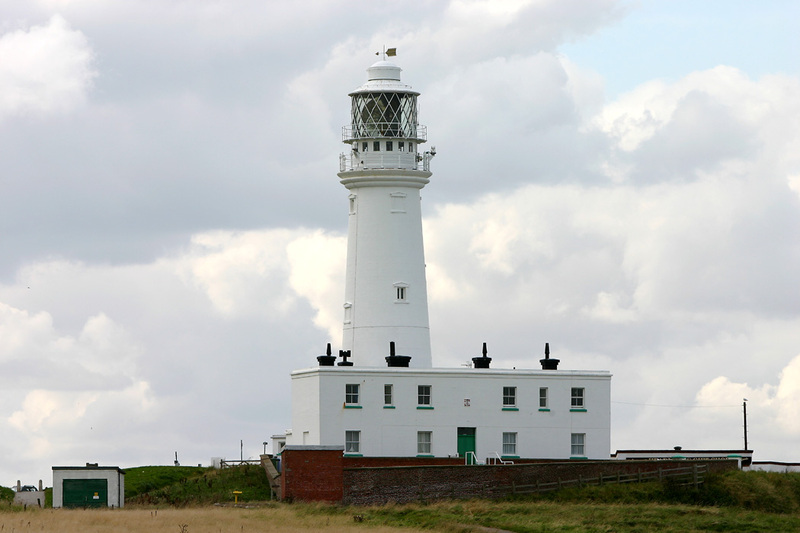 In March 2012 the Heritage Lottery Fund granted £68,600 to support preparation of a larger proposal for restoration of the lighthouse and development of a visitor center. In 2013 the trust sought another £650,000 for the restoration, and in September it was awarded £470,500. The restored lighthouse opened in 2016. Located near the end of the spit; accessible by bicycle or hiking several miles, but beware: since 2013 high tides wash over the route. Check tide tables before visiting the lighthouse. "Spurn Safari" guided tours are also available. Site open, tower open Friday through Sunday afternoons, weather permitting. Owner: Yorkshire Wildlife Trust. 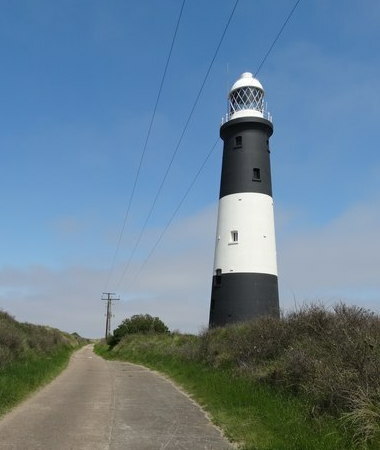 Site manager: Spurn Point National Nature Reserve (Spurn Lighthouse). ARLHS ENG-138; ex-Admiralty A2424. 1870. Active; focal plane 8 m (26 ft); white light, occulting every 2 s. 9 m (30 ft) round cast iron tower with lantern and gallery, painted white. Keeper's house recently demolished. Steve Roe has a good closeup and a photo showing both lights, Trabas has a photo, a history of the station is available, there is also a historic photo showing the keeper's house, and Google has a satellite view. John Mobbs and John Best visited these lighthouses in April 2013 and found them to be in very poor condition, succumbing to rust. These lights replaced the Paull Light after a shift in the river channel. In the east of England, the word clough refers to a channel draining a wetland. 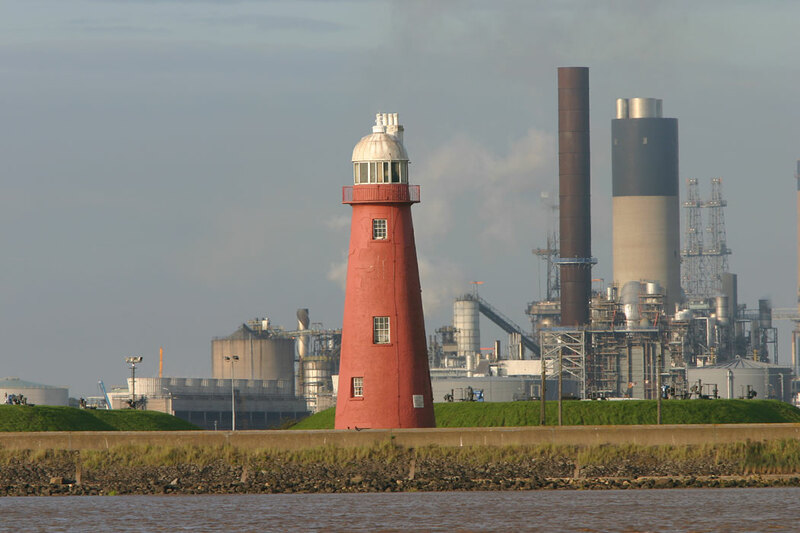 Located on the north bank of the Humber about 1 km (0.6 mi) below Paull. Site open, tower closed. Operator: Port of Hull. ARLHS ENG-177; Admiralty A2506; NGA 1928. 1870. Active; focal plane 13 m (43 ft); white light, occulting every 2 s. 15 m (50 ft) round cast iron tower skeletal tower with lantern and enclosed watch room, painted red; lantern dome is white. Keeper's house recently demolished. Steve Roe has a good photo and a photo showing both lights, Trabas has a photo, a history of the station is available, there is also a historic photo showing the keeper's house, and Google has a satellite view. 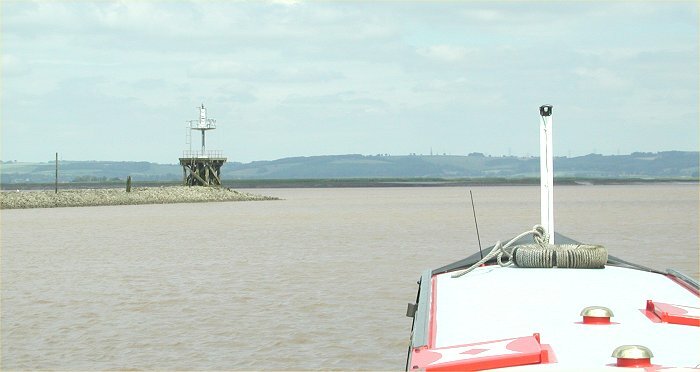 Located on the north bank of the Humber 113 m (125 yd) downstream from the front light and about 1.1 km (0.7 mi) below Paull. Site open, tower closed. Operator:Port of Hull. ARLHS ENG-155; Admiralty A2508; NGA 1932. 1836. Inactive since 1870. Approx. 14 m (46 ft) round stucco-covered brick tower with lantern and gallery, attached to a 2-story dwelling. Tower and dwelling painted white. Paul Glazzard's photo is at right, Mick Evans has a good photo, Graham Sivills has a nice closeup, and Google has a street view and a satellite view. Sibling of the Killingholme South Low Light on the other side of the river. The lighthouse was built by Trinity House as a free-standing tower; the house was added sometime after deactivation. The building was transferred to the Humber Conservancy in 1908 but was auctioned into private hands in 1947. The lighthouse was restored by its owner, graphic designer James Deighton, in the late 1980s. Deighton extended the building, adding a cottage that was available as a bed and breakfast. In February 2010 the property was for sale for £189,950, and there is a report that it sold in 2011 for £145,000. Located on the north bank of the Humber at Pasull, about 8 km (5 mi) below Hull. Site open, tower closed. Owner/site manager: private. ARLHS ENG-099. 1927. Decommissioned 1975. Steel lightship, 30.5 m (100 ft) long, painted black. Steve Cameron's photo is at right, Howard Pulling has a good 2008 photo, Pat Wride has another photo, and Google has a street view and a satellite view. Built at Goole on the Ouse, the ship served until 1959 at the Spurn station, 7.5 km (4.5 mi) east of Spurn Point. It was then moved to the Bull Shallows station just off Spurn Point. Acquired by the Hull City Council in 1983, the ship was restored and has been on public display since 1987. In 2011 it was closed for repair and refurbishment. Located at the Hull Marina on Castle Street in downtown Hull. Site open, ship open to guided tours on Sunday afternoons mid June through early September. Owner: Hull City Council. Site manager: Hull Museums. ARLHS ENG-136. 1933. Inactive. 6 m (20 ft) square skeletal tower with lantern, gallery, and an enclosed equipment room in the base. Lighthouse painted red. Millichamp has photos and the history of the lighthouse, and Google has a street view and a satellite view. Dr. Neil Clifton has a 1974 photo of the lighthouse at its original location. 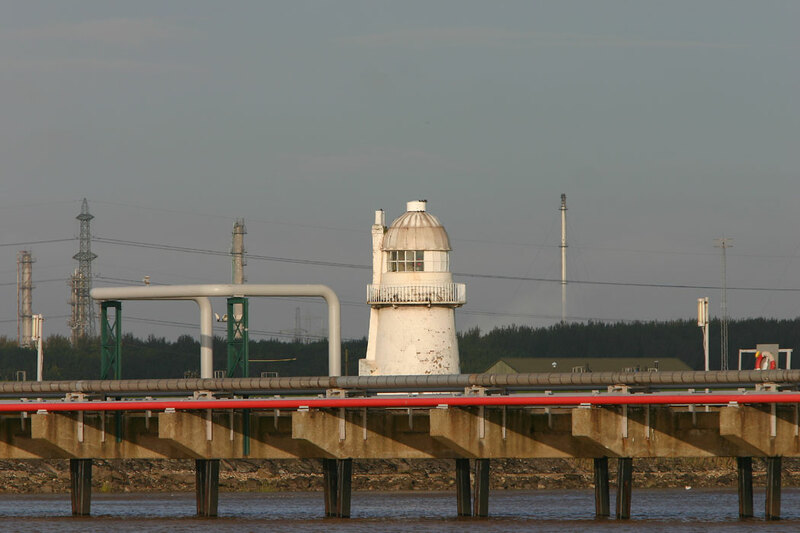 This lighthouse formerly stood near Faxfleet in the confluence of the Rivers Ouse and Trent, which combine to form the Humber estuary. It was replaced by a post light on the original wood platform. Trabas has a photo of the current Apex light (Admiralty A2570.9); it is a directional light (three flashes every 5 s, red, green or white). The lighthouse has been relocated to the Goole Docks, a short distance west of Bridge Street. Owner/site manager: Yorkshire Waterways Museum. Site open, tower closed. ARLHS ENG-297. Date unknown. Active; focal plane 12 m (39 ft); continuous red light. 14 m (46 ft) round brick tower with lantern and gallery, mounted on an octagonal brick base. The active light appears to be on the gallery railing. Base unpainted; tower painted white. Steve Fareham has a nice 2007 photo, Trabas has a photo, Millichamp has two photos, Wikimedia has several photos, and Google has a street view and a satellite view. Located in a pasture on the south bank of the Ouse between Whitgift and Ousefleet and about 10 km (6 mi) below Goole. Site tower closed (private property) although the lighthouse can be seen from a distance. Operator: Port of Goole. ARLHS ENG-185; Admiralty A2571.9. Date unknown (lightship station established 1877). Active; focal plane about 9 m (30 ft); light pattern unknown. 10 m (33 ft) square skeletal tower centered on a hull about 10 m (33 ft) long. A daymark encloses the upper 2/3 of the tower. Entire structure and hull painted red. Martin Wilson has a photo, and Google has a satellite view. Located in the Humber off the headland of Whitton Ness, the northernmost point of Lincolnshire, about 1.5 km (1 mi) east of Whitton. Accessible only by boat. Site open, tower closed. Date unknown (lightship station established 1868). Active (? ); focal plane about 9 m (30 ft); light pattern unknown. 10 m (33 ft) square skeletal tower centered on a hull about 10 m (33 ft) long. A daymark encloses the upper 2/3 of the tower. Entire structure and hull painted red. Andy Beecroft has a photo, and Google has a satellite view. Located in the Humber off the point of Whitton Ness, about 500 m (1/3 mi) east of the Upper Whitton lightfloat. Accessible only by boat. Site open, tower closed. Date unknown. Active (? ); focal plane about 9 m (30 ft); light pattern unknown. 10 m (33 ft) square skeletal tower centered on a hull about 10 m (33 ft) long. A daymark encloses the upper 2/3 of the tower. Entire structure and hull painted red. No photo available, but Google has a satellite view. Located in the Humber on the east side of Whitton Ness. Accessible only by boat. Site open, tower closed. 1852. Inactive since 1920. 14 m (46 ft) round stucco-covered brick tower with lantern and gallery, attached to a 1-story keeper's house. Tower painted white, lantern dome black. Photographers Resource has a page with photos, and Google has a satellite view. Formerly in poor condition, this lighthouse was restored in 2003 as a private residence. However, David Wright's 2006 photo shows it to be in a continuing need of repainting. Located at the end of Station Road on the south bank of the Humber at Killingholme. Site and tower closed, but the lighthouse can be seen from the road. Owner/site manager: private. ARLHS ENG-061. 1876 (station established 1836). Inactive since 2017. 24 m (79 ft) round brick tower with lantern and gallery, painted red; lantern dome is white. Former stucco covering of the tower has nearly all peeled off. David Wright's photo is at right, Photographers Resource has a page with photos, Trabas has a good photo, Wikimedia has a photo, Marinas.com has aerial photos, and Google has a satellite view and a very distant street view. 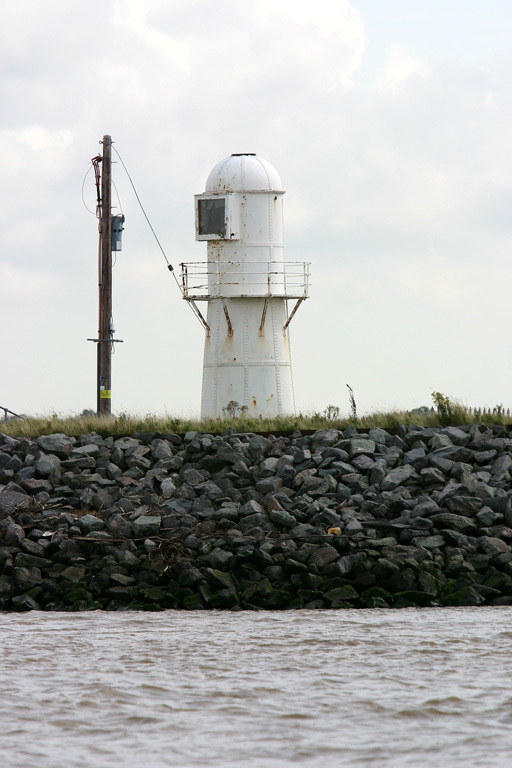 Located about 190 m (210 yd) west of the front light on the south bank of the Humber at Killingholme. Site open, tower closed. Operator: Port of Immingham. ARLHS ENG-175; ex-Admiralty A2440.1; NGA 1916. 1836. Inactive since 2017. 14 m (46 ft) round stucco-covered brick tower with lantern and gallery, painted white. David Wright has the photo at right and also a closeup, Photographers Resource has a page with photos, Trabas has a photo, Marinas.com has aerial photos, and Google has a satellite view. Located about 400 m (1/4 mi) southeast of Station Road on the south bank of the Humber at Killingholme. Site open, tower closed. Operator: Port of Immingham. ARLHS ENG-176; ex-Admiralty A2440; NGA 1912. 1919 (lightship station established 1832). Inactive. The light was mounted on a square tower atop the fort. The U.K. National Education Network has an aerial photo, Wikipedia has a distant view, and Bing has a satellite view. This is one of two Humber Forts built during World War I to protect the entrance to the Humber. Located in the center of the entrance to the Humber, about 2.5 km (1.5 mi) southwest of Spurn Point. Accessible only by boat. Site open, tower closed. Date unknown (station established 1919?). Active; focal plane 21 m (69 ft); red flash every 5 s. Mast mounted atop the fort. Wikipedia has a closeup, Trabas has a photo, and Google has a good satellite view. This is one of two Humber Forts built during World War I to protect the entrance to the Humber. Located on the south side of the estuary about 1.5 km (1 mi) east of Humberston. Accessible only by boat. Site open, tower closed. Admiralty A2431; ex-NGA 1808. Date unknown (lightship station established 1873). Active; focal plane 28 m (92 ft); two white flashes every 10 s. 28 m (92 ft) square platform with helipad. The Inner Dowsing lightship station was replaced in 1971 by a former coal board drilling rig. The light tower used atop that platform was taken from the decommissioned lightship LV-87 (see below). This tower was deactivated in 1991 and removed. For a time the lightships returned, but in the early 2000s a light was installed on the B1D gas drilling platform nearby. The NGA sailing directions for the North Sea (Publication 192, page 61 of the 2010 edition) have a small, blurry photo of that platform. Located in the North Sea about 50 km (30 mi) east of the Humber entrance. Accessible only by boat. Site and tower closed. ARLHS ENG-203; AdmiraltyA7560.1 (ex-A2420); NGA 1764. Date unknown. Active; focal plane about 6 m (20 ft); red flash every 5 s. NGA lists a flagstaff, and Trabas's photo shows the flagstaff, but the light is mounted on a 2-story pump station building. Google has a satellite view and a distant street view. 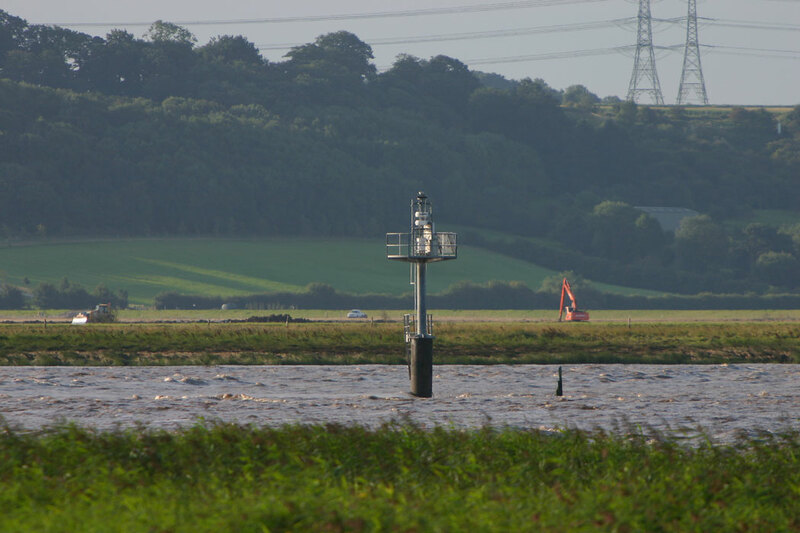 Located on the south coast of the The Wash near Gedney Drove End, about 4 km (2.5 mi) northwest of the Nene mouth. Site open, tower closed. Admiralty A2394; NGA 1728. 1840 (station established 1665). Inactive since 1921. 19 m (61 ft) round cylindrical brick tower attached to a 2-story brick keeper's house. Entire building painted white. Evelyn Simak has an excellent photo, Richard Brown has a 2008 photo, and Google has a 2009 street view and a satellite view. 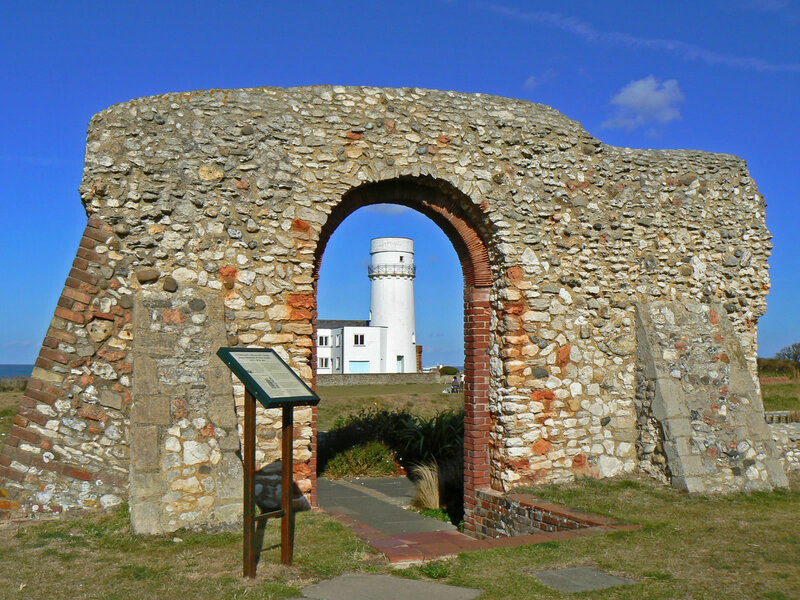 For many years lights were shown from St. Edmund's Chapel, which was built in 1272; a photo shows the chapel ruins close to the lighthouse. The original wood lighthouse burned in 1777 and was replaced the next year by a second wood lighthouse. The second light was one of the first lighthouses to burn oil. 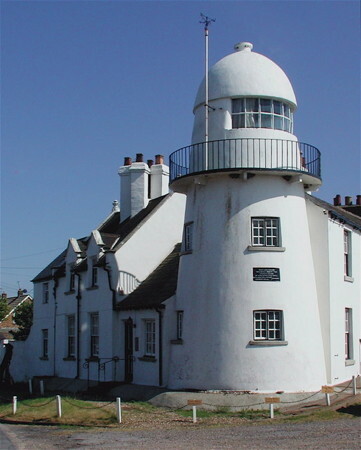 Trinity House acquired the light station in 1837 and completed the present building in 1840. After deactivation the station was sold as a private residence, and the private owners built an additional circular story to replace the original lantern. In 2007 the owner, 60's rock star Bip Weatherall, placed the lighthouse on sale, and in late 2008 he lowered the price tag to £499,000. In 2016 the property was purchased by L&J Leisure and refurbished for weekly rental. A lightning strike in July 2018 damaged brickwork at the top of the tower. The light stands at the eastern entrance to The Wash, the U-shaped bay between Norfolk and Lincolnshire. 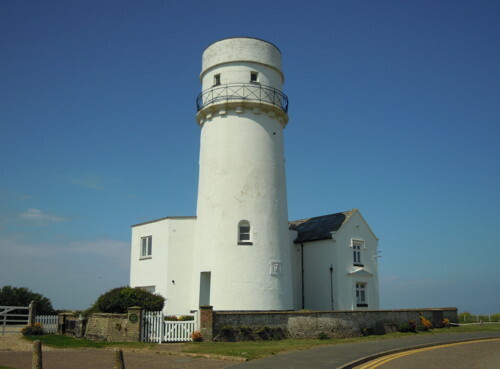 Located on Lighthouse Lane on the north side of Hunstanton, a town about 30 km (19 mi) north of King's Lynn. Site open; tower open only to guests. Owner: L&J Leisure. Site manager: The Old Lighthouse. ARLHS ENG-056. 1998. 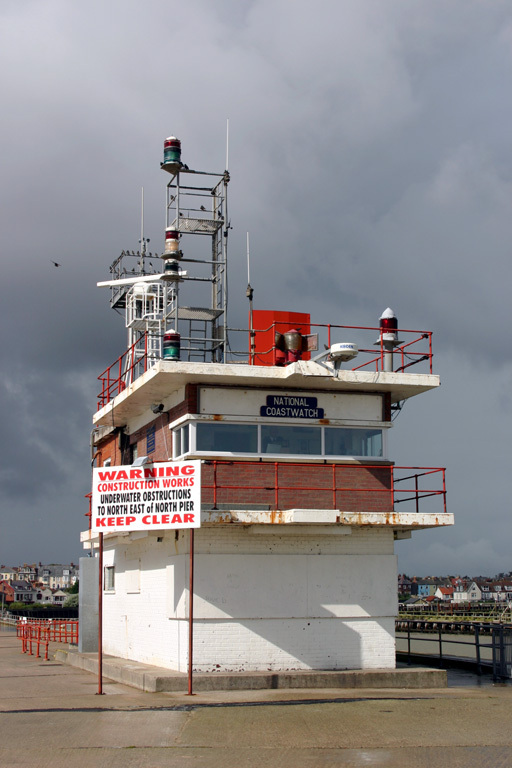 Active; focal plane 8 m (26 ft); two continuous red lights, one above the other, on a mast in front of a pierhead lifeboat station. Trabas has a photo, Peter Facey has a photo of the pier, and Google has a satellite view. 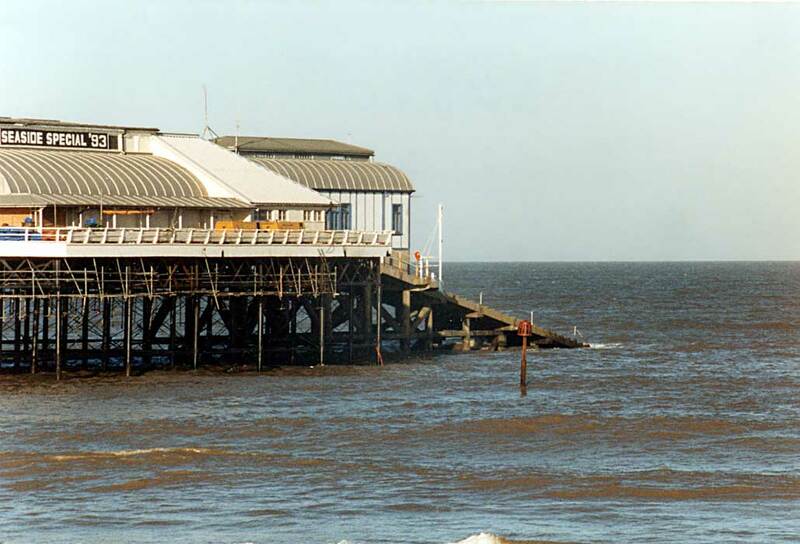 Located on the pier at Cromer, about 1.6 km (1 mi) northwest of the historic lighthouse. Site open. Owner/site manager: RNLI Cromer Lifeboat Station. Admiralty A2344; NGA 1680. 1833 (station established around 1719). 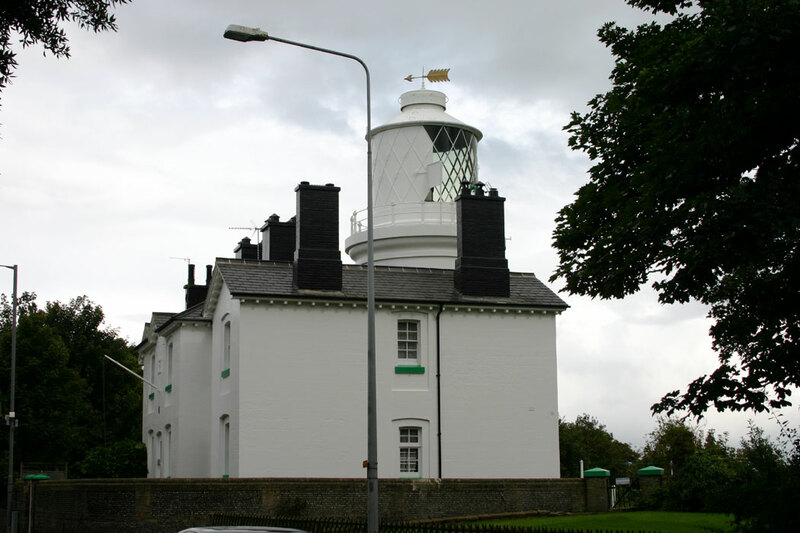 Active; focal plane 84 m (276 ft); white flash every 5 s. 18 m (59 ft) octagonal cylindrical brick tower with lantern and gallery, painted white, attached to two 2-story keeper's houses. The houses are available for overnight accommodations. Photographers Resource has a page with photos, Trabas has a fine closeup photo, a 2007 photo is available, Wikimedia has a good photo, Pat Niyomsilp has a street view, and Google has a satellite view. 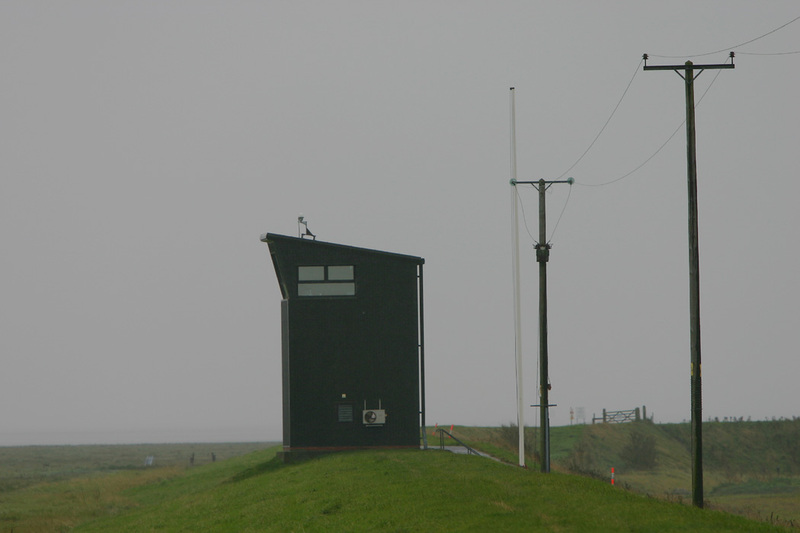 The light station is about 400 m (1/4 mi) from the cliffs overlooking the North Sea. These cliffs are subject to rapid beach erosion. The first lighthouse was built privately in 1676 and never lit due to opposition from Trinity House; it collapsed over the cliff in 1700. Trinity House built a brick lighthouse in 1719. In 1792 a rotating apparatus was installed making this only the second British lighthouse to display a flashing light. The present lighthouse was built in 1833 when it appeared that the 1719 tower would soon collapse over the cliff; it finally did so in 1866. Located on a high point above the cliffs east of Cromer, a town about 30 km (19 mi) north of Norwich. Site open, tower closed. Operator: Trinity House. ARLHS ENG-028; Admiralty A2342; NGA 1676. 1791. 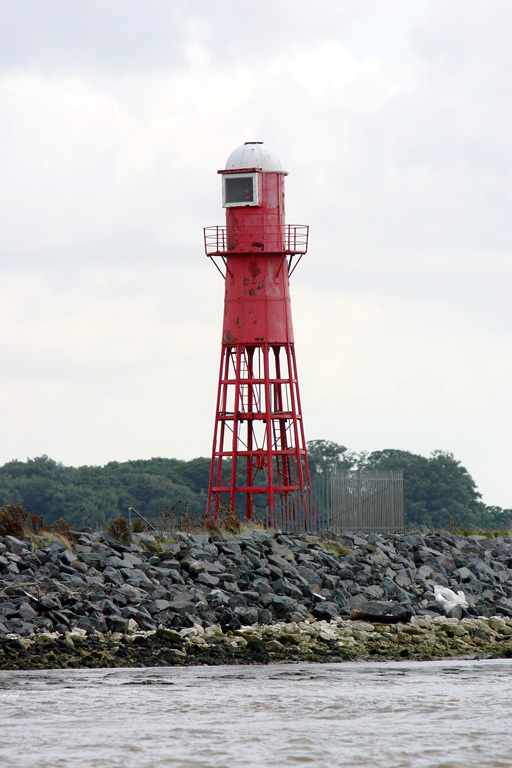 Active (privately maintained); focal plane 41 m (135 ft); three white flashes every 30 s. 26 m (85 ft) round brick tower with lantern and gallery, painted with red and white horizontal bands. 1st order Fresnel lens (1868) in use. The two 2-story brick keeper's houses have been private residences since the light was automated in 1929. The name of this lighthouse is pronounced "Haisbro." Angela and Chris Pye's photo is at right, Trabas has an excellent photo, Photographers Resource has a page with photos, Wikimedia has several photos, and Google has a street view and an excellent satellite view. 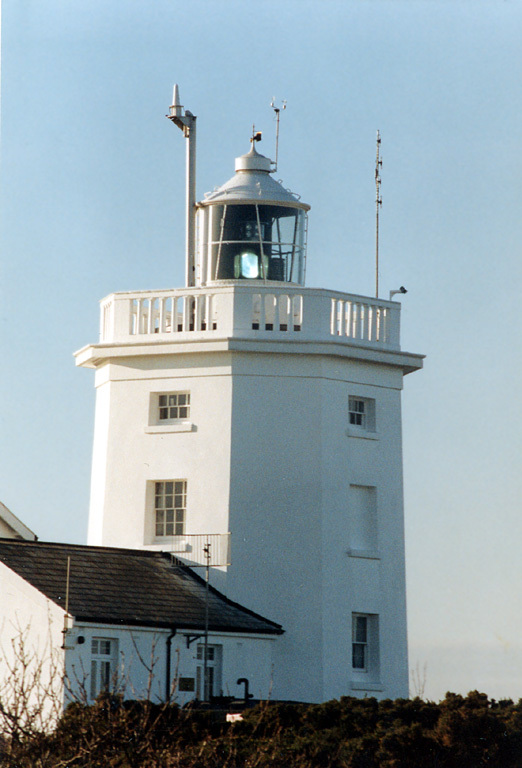 This historic light was declared redundant by Trinity House in 1988, but a local trust was organized to continue its operation. 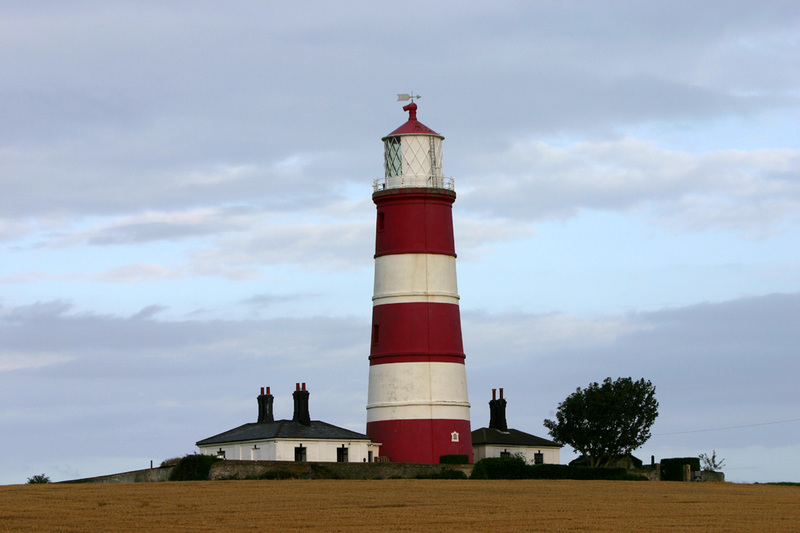 In 1990 a special act of Parliament chartered the Happisburgh Lighthouse Trust as Britain's first (and, so far, only) private lighthouse authority, allowing Trinity House to transfer ownership and operation to the trust. The lighthouse was originally accompanied by a low light, which was deactivated in 1883. In 2008 ruins of the low light were visible on the beach, as seen in Gary Troughton's photo and a second photo. The lighthouse was repainted and repaired in 2009 at a cost of £35,000. In 2016 one of the keeper's houses was for sale for £345,000. Another repainting is scheduled for 2018. Located in Happisburgh, a seaside village on the "shoulder" of Norfolk, about 25 km (15 mi) northeast of Norwich. Site open; tower open to guided tours on selected open days in the spring and summer, or by prior arrangement. Owner: Happisburgh Lighthouse Trust. Site manager: Friends of Happisburgh Lighthouse . ARLHS ENG-050; Admiralty A2336; NGA 1668. 1840 (station established 1616). Inactive since 1921. 19 m (62 ft) round brick tower with lantern and gallery. Tower painted white, lantern black. Ian Wright has a 2013 view, and Google has a satellite view. The original lantern was replaced many years ago by a circular observation room, as seen in Paul Smith's 2009 photo, Wikimedia's 2010 photo, and Google's distant street view taken in April 2011. Clearly the lighthouse was restored and repainted in 2011-12, and the present lantern was added at that time. Millichamp has a historic postcard view (about halfway down the page) of the present lighthouse with its first order lantern. The original lighthouse was replaced in 1687. 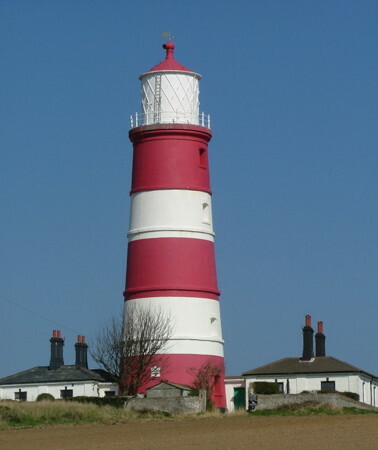 The light was the rear light of a range from 1677 to 1791, when the Happisburgh lighthouse was built. The present lighthouse and keeper's house are a private residence. The property was for sale in 2005, but we do not know if it was sold. It adjoins the Hermanus Leisure resort. Located off the Holway on the south side of Winterton-on-Sea, a seaside resort village about 10 km (6 mi) north of Great Yarmouth. Site and tower closed (private property). Owner/site manager: private. ARLHS ENG-310. 1887. Inactive since 2007. 21 m (69 ft) round brick tower, unpainted, with lantern and gallery. Charles Shelbourne's photo is at right, Photographers Resource has a page for the lighthouse, Gary Skipper has a good 2007 photo, Wikimedia has photos, Trabas has a photo, and Google has a street view and a satellite view. The River Yare makes a right-angle bend to the east just before reaching the sea, and this lighthouse stands by the bend displaying its light through the river mouth. Originally it displayed a continuous red light; later it became also the rear light of a range. Possibly endangered: listed as a historic building by Englich Heritage, but no preservation plan is in evidence. Located at the end of Pier Road in Gorleston. Owner: Great Yarmouth Port Authority. ARLHS ENG-303; ex-Admiralty A2306.1; ex-NGA 1636. 1955 (station established 1852). Active; focal plane 11 m (36 ft); red flash every 3 s. 8 m (26 ft) square 2-story brick and concrete building with two galleries; the light is mounted on the roof along with communications equipment, harbor control lights, and the fog horn (three blasts every 60 s). Lower story is white, upper story unpainted red brick. Trabas has a photo, Richard Barnes has a photo, another photo is available, and Google has a satellite view and a street view across the river entrance. The original lighthouse was an octagonal brick tower of similar height; Photographers Resource has postcard views of that tower. The present lighthouse was presumably built as a harbormaster's office, but it is now a Coastwatch Station. Located at the end of the south pier in Gorleston, the seaport on the south side of Great Yarmouth. Operator: Great Yarmouth Port Authority. Site manager: National Coastwatch Institution. ARLHS ENG-221; Admiralty A2304; NGA 1624. 1874 (station established 1609). Active; focal plane 37 m (121 ft); white flash every 15 s. 16 m (52 ft) round brick tower with lantern and gallery, painted white, attached to 2-story keeper's house. Kevin Millican's photo is at right, Photographers Resource has a page with photos, Stephen Craven has a photo, Trabas has a photo, Marinas.com has aerial photos, and Google has a street view and a satellite view. 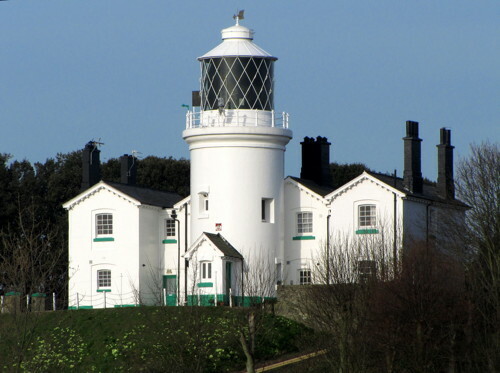 England's oldest official light station celebrated its 400th anniversary in 2009. Actually, no one is sure when the first light was shown, but Trinity House took over its administration and built a new light in 1609. It was replaced in 1628 and again in 1676. A series of low lights, many of them temporary, were used in conjunction with the high lighthouse. PortCities London has a drawing of the 1832 low light, and Mike Lewis has posted a historic photo of the 1866 low lighthouse, which was discontinued and demolished in 1923. The lighthouse marks Lowestoft Ness, the easternmost point of the British Isles. It overlooks Sparrow's Nest Park and the Lowestoft Maritime Museum. Tours of the lighthouse are offered on the first Saturday afternoon of each month, April through August. Located on Yarmouth Road (A12), on a bluff about 1.5 km (1 mi) north of the Lowestoft harbor entrance. On-street parking available. Site open, tower closed except during tours. Operator: Trinity House. ARLHS ENG-072; Admiralty A2280; NGA 1620. 1847. Active; focal plane 12 m (39 ft); green light, 4 s on, 1 s off. 9 m (30 ft) hexagonal cylindrical brick tower with lantern and gallery, rising from the center of a 1-story pavilion. Lighthouse painted white. Trabas has a photo, and Google has a satellite view and a distant street view of both pier lighthouses. Located on the end of the stone pier marking the narrow entrance to the harbor of Lowestoft. Accessible by walking the pier. Operator: Port of Lowestoft. ARLHS ENG-263; Admiralty A2286; NGA 1600. 1847. Active; focal plane 12 m (39 ft); red light, 4 s on, 1 s off. 9 m (30 ft) hexagonal cylindrical brick tower with lantern and gallery, rising from the center of a 1-story pavilion (used as a pilot station). Lighthouse painted white. Fog horn (4 blasts every 60 s). Trabas has a photo, and Google has a satellite view and a distant street view of both pier lighthouses. Located on the end of the stone pier marking the narrow entrance to the harbor of Lowestoft. Accessible by walking the pier. Operator: Port of Lowestoft. ARLHS ENG-264; Admiralty A2284; NGA 1604. 1832 (Richard Suter). Inactive since 1864. 9 m (30 ft) round brick tower, painted white. Adrian Pye has a 2010 photo, Rene Schoeters has a 2017 photo, and Google has a satellite view. The usefulness of the lighthouse was short-lived, as the coastal channel shifted away from its location. In 1929 it was sold to the owners of the neighboring Pakefield Hall, which later became Pontin's Pakefield Holiday Park. The lighthouse was slightly damaged by machine gun fire during a German air raid on May 12, 1943. In 2000 local volunteers renovated the lighthouse as a coastwatch station. Located off London Road (A12) about 3 km (2 mi) south of Pakefield, a town just south of Lowestoft. Site open, tower closed. Owner: private. Site manager: Pakefield Coastwatch. ARLHS ENG-098. 1890 (James Douglass). Active; focal plane 37 m (122 ft); four flashes every 20 s, white or red depending on direction. 31 m (102 ft) round brick tower with lantern and gallery, painted white, attached to a 2-story keeper's house. 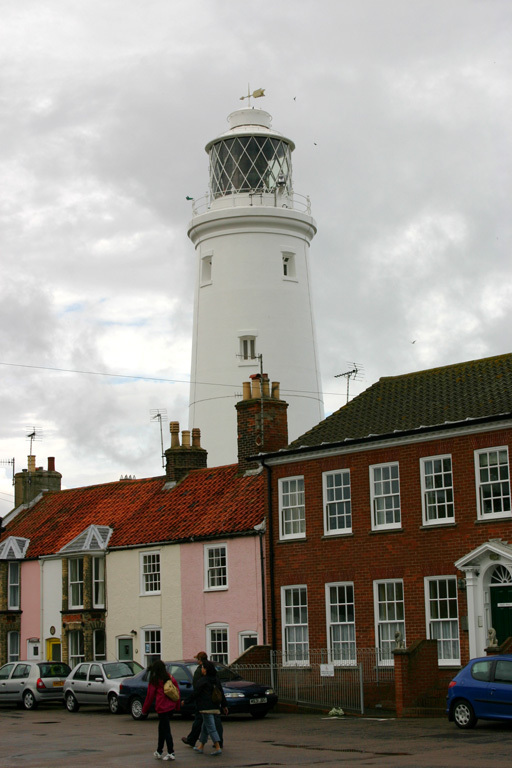 A photo by Ella Mullins is at right, the Southwold Museum has a page on the lighthouse, Photographers Resource has a page with photos, Trabas has a photo, Steve Fareham has a good photo, Marinas.com has aerial photos, and Google has a street view and a satellite view. Thanks to its urban location, the lighthouse was automated quite early, in 1938. 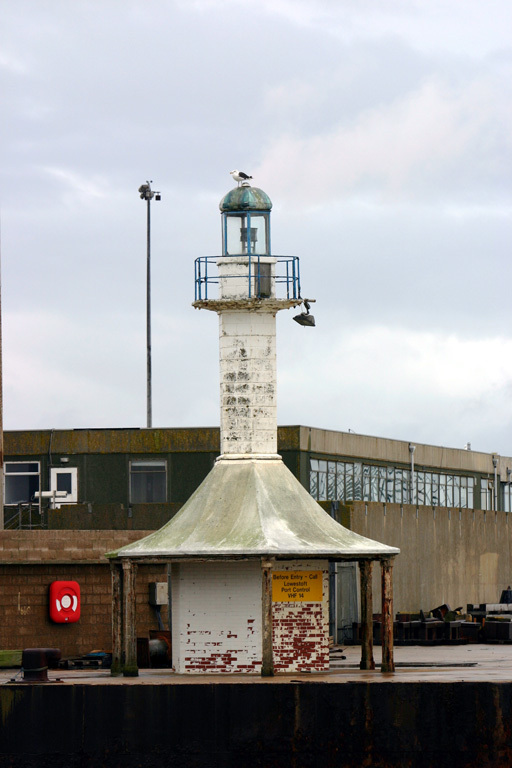 The light was upgraded and extended in range in 2012-13 in order to take over the duties of the discontinued Orfordness Light (next entry). Located in the center of the seaside resort town of Southwold, about 15 km (9 mi) south of Lowestoft. Site open, tower open to guided tours on weekends, Wednesdays, and bank holidays late March through October, also Thursdays and Fridays in August; there are some additional open dates during the summer. Operator: Trinity House. Site manager: Southwold Millennium Foundation . ARLHS ENG-135; Admiralty A2272; NGA 1588. 1793 (station established 1637). Inactive since 2013. 30 m (98 ft) round old-style brick tower with lantern and gallery, painted white with two horizontal red bands. The rotating 1st order Chance Brothers Fresnel lens, installed in 1914, is now on display at the headquarters of the International Maritime Organization in London. J. Graham's closeup photo is at right, Alison Rawson has a fine closeup, Trabas has a photo, Wikimedia has many photos, and Google has a satellite view. The tower was formerly attached to two keeper's houses, which were demolished in 1959. This famous lighthouse is gravely endangered. Orford Ness is a 20 km (13 mi) long barrier island off southeastern Suffolk. There have been as many as eight low lighthouses and three high lighthouses here. The 1792 low lighthouse was lost to beach erosion in 1887, and by 2004 there was concern about rapid beach erosion near the surviving lighthouse. 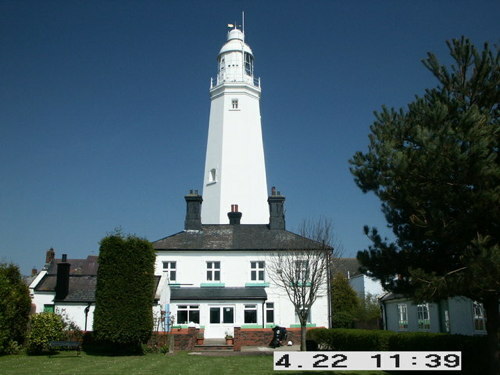 In March 2009 Trinity House announced that the lighthouse could fall in as little as five years, and a decision to move or demolish it was needed within two years. 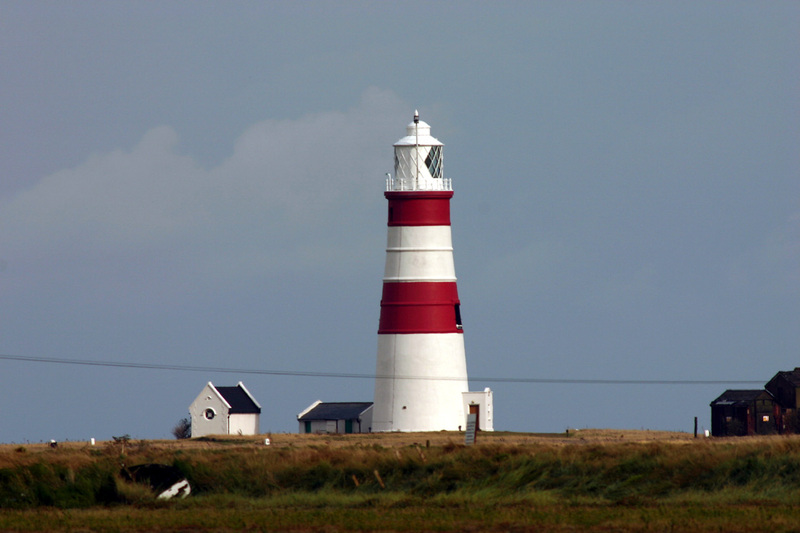 In January 2010 the buildings were sold for £2000 to Nicholas Gold, who established the Orfordness Lighthouse Trust. 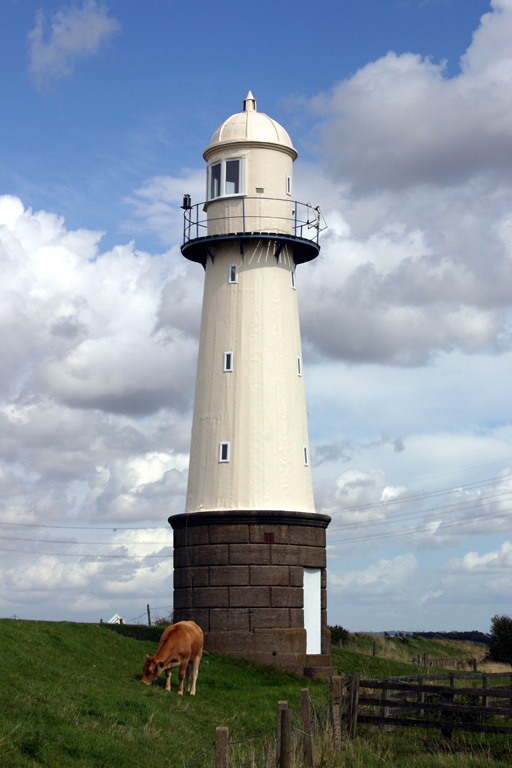 Gold claims the National Trust, stewarts of the Orford Ness National Nature Reserve, has obstructed his efforts to save the lighthouse, although the National Trust denies this. The shoreline has been bolstered with bags filled with gravel and shingles, and Gold's organization has removed artifacts from the lighthouse. In April 2014 the lighthouse trust began offering public tours of the lighthouse. In January 2016 winter storms threatened to undermine the lighthouse; an emergency appeal raised £10,000, enough to place sandbags around the base of the lighthouse. The Ness was a restricted military area for many years; it was opened to the public by the National Trust in 1995 as a nature reserve and historic site. Located about 5 km (3 mi) southeast of Orford; accessible by passenger ferry and hiking trail (40 minutes each way). Site open, tower open for tours on selected Sundays during the warmer months (reservations required). 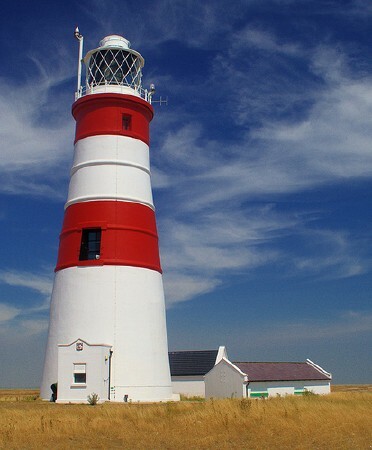 Owner/site manger: Orfordness Lighthouse Trust . ARLHS ENG-096; ex-Admiralty A2258; ex-NGA 1564. 1932. Decommissioned 1973. Steel lightship, length 30 m (99 ft), painted red; the light was shown from a skeletal tower with lantern and gallery amidships. Shane Mash has a closeup street view, and Google has a satellite view. The ship served on the East Goodwin, Mid-Barrow, and Cromer stations. It was sold to the Haven Ports Yacht Club in Ipswich, which has used the vessel as its club ship ever since. Before the sale, the light tower was removed and transferred to the Inner Dowsing light platform. The club was able to acquire the light tower of Lightship 88 as a substitute, although the two towers are not identical. Moored at the Suffolk Yacht Harbor near Ipswich. Site open, vessel closed. Owner/site manager: Haven Ports Yacht Club. ARLHS ENG-326. Orfordness Low (1836-1887), Suffolk. This lighthouse was lost to beach erosion. ARLHS ENG-329. Salt End Range (1870-1960s), Humber. The lighthouses were demolished to make way for a BP oil terminal. ARLHS ENG-308. 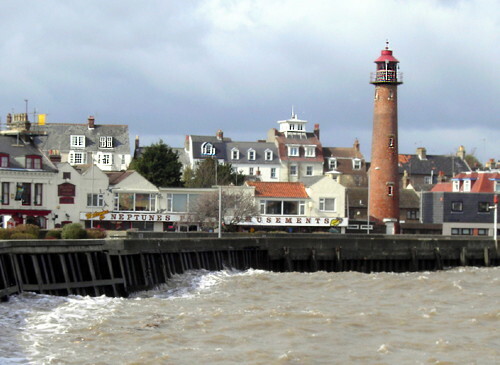 East Nene (1881) was never lit as a lighthouse. It is an 18 m (60 ft) old-style (bluntly conical) brick tower crowned by an octagonal brick lantern room with circular windows. Lighthouse painted white. The tower is attached to a 1-story dwelling, which is not the original house; it was added early in the 20th century. From 1933 to 1939 the house was occupied by Sir Peter Scott (son of the Antarctic explorer), a famous naturalist and conservationist. As a result the lighthouse is often called "Sir Peter Scott's Lighthouse." Located on the east bank of the Nene Cut, the artificial outlet of the Nene River, just above The Wash. Artur Tejchman has a street view, and Google has a satellite view. 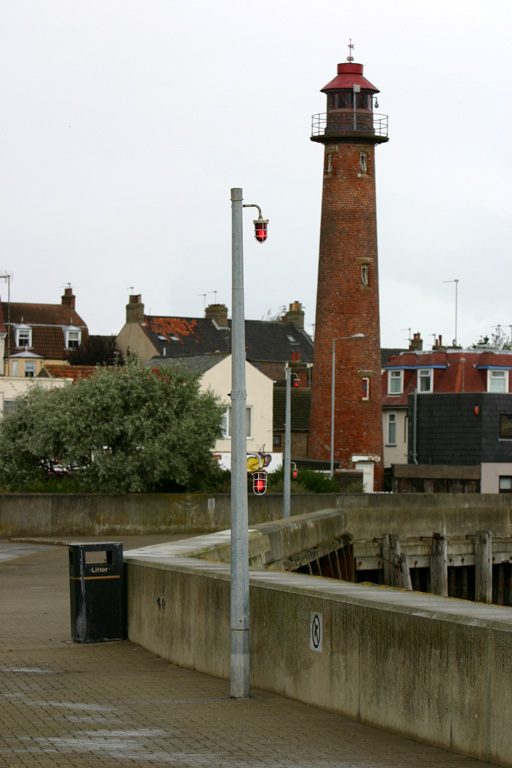 West Nene (1881) was also never lit as a lighthouse. The tower is attached to a 1-story modern dwelling. Located on the west bank of the Nene Cut, the artificial outlet of the Nene River, just above The Wash. Google has a street view and a satellite view. Posted August 27, 2004; checked and revised May 13, 2018. Lighthouses: 30, lightships and lightfloats: 7. Site copyright 2018 Russ Rowlett and the University of North Carolina at Chapel Hill.